Players turning 5 or 6 during the current calendar year qualify for the Pony Program. This program begins in September and ends in mid-March for a single registration fee. 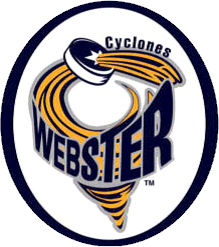 Most practices will occur at Webster Ice Arena although some practices may occur at other rinks depending on ice availability. Participants in the Pony program should expect to skate twice a week with at least one practice on the weekend. Skaters in the Pony Program will play in 4 or 5 Jamborees (multiple short games on one day) at rinks in the Rochester area. These Jamborees are organized by EAHC and Webster generally is the host for one Jamboree. Jamborees occur roughly once per month starting in November. A pair of hockey socks and a jersey are supplied as part of the Registration fee. Participants are required to supply full hockey equipment including a certified hockey helmet with face mask, a neck guard, shoulder pads, elbow pads, hockey gloves, hockey pants, shin guards, single blade hockey skates and an ice hockey stick. Participation in non league Jamborees, Tournaments, and Team Events (ex: parties) are not included in the fees. After the season begins, a parent meeting will held and any additional activities will be discussed. Registration opens in early June and players should register as soon as possible as we will close this program when full. All discounts have been already factored into the fees shown during registration. To register for this program, please contact the House Director at house@wyha.com for placement and to have Registration re-opened. Ponys will begin practice in mid-September and no credits will be given for late registration. Players may not participate in any team activities until they have registered and paid. Use the Registration below to register for the Pony/6U Program (other Programs have separate registrations).